This Website Is No Longer Active. : Neath Port Talbot Social Services in deep trouble once again. 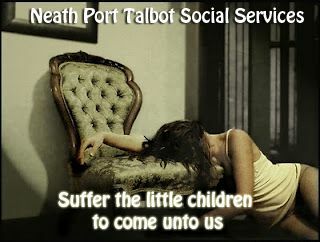 Neath Port Talbot Social Services in deep trouble once again. 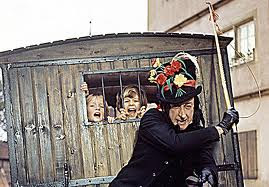 Neath Port Talbot Social Worker goes about his daily business. The following is taken from "child abuse" supporting South Wales Evening Post. Neath Port Talbot's children's services is facing problems of biblical proportions, scrutiny board members have warned. The warning came as a scrutiny committee met to discuss an action plan drawn up to address issues in the council's provision of services for children and young people following an inspection by Care and Social Services Inspectorate Wales (CSSIW) last September. Among the areas causing concern were the high turnover of staff, including the loss of experienced practitioners, reliance on agency staff, the high number of unallocated cases and high case loads for social workers. During the past year 18 social workers have quit — there are currently 98 on the books — and the average caseload per full-time equivalent social worker was 32.4 (as of March last year). Around 1,700 children and young people are on the department's radar. Co-opted scrutiny member, Ray Preece drew comparisons with the Bible by saying: "It's a nationwide problem. I think that Solomon would have a job sorting this out." In particular Mr Preece, who is also a governor at Llangatwg School, expressed his concern over the pressures an increase in cases placed on staff, who are already turning their backs on the authority. He sad: "I shudder when I think of one person having to deal with 30 cases. Let's do something whatever it is." Another co-opted scrutiny member, Chris Adams, added: "These things have come up time and again over the years in scrutiny. We have been saying this for years. It is not going to get any better. No local authority can cope financially, the problem is just so enormous." The council's director of social services, health and housing, Tony Clements, acknowledged his department faced challenging times but said he remained positive and pointed at plans already in place to spend around £1 million on the service. He said: "The complexity and circumstances coming to us now is far more of a challenge than it was 10 to 15 years ago. It is absolutely clear that some of the issues around drugs and alcohol and mental health are having a decided impact on the requirements of the service and bringing children into care. "It is a huge issue and a huge challenge. Money alone is not the solution we need to look at how best to target that increase and the way we make decisions." Karen Jones, interim head of children and young people services, admitted: "People still working for us say that pressure is the main reason. The greatest cause is work load. I want to look at the staff who have left and the reason why. Pay is an issue but I don't think at the moment, from what staff are telling us, that it is the major issue, it is workload." Just a couple of points to make regarding the above article. I find it deeply offensive that children are referred to as " on the departments radar." More innocents to be removed from GOOD HOMES to be used and abused by a system that gives them no voice just like N*t*a%h@ Lewis ? To be trafficked in order to meet quota's and targets ? Children are people with rights and with feelings.They are the future of this nation. They should not be treated as a "marketable commodity." I could go on but you know the score. NOT ALL SOCIAL WORKERS ARE BAD ! Almost on a weekly basis myself and other organisations receive feedback from GOOD HONEST SOCIAL WORKERS who are sick and tired of what they are being asked to do and the way that Social Services operate. Their conscience no longer allows them to be a part of it. I know that Social Workers have left Neath Port Talbot in disgust at what is going on where they work. One joker Ray Preece who is no doubt still covering up for the abuse that Linda's daughter suffered at the hands of the "sadistic "Julie Rzezniczek and others has now decided to quote the Bible. Well here is my slightly biblical message to Social Services in Neath Port Talbot. Stick this poster up outside your offices. They went over to America and kidnapped my friend Linda daughter I hope those involved will be punished soon. You have stated Ray Preece it was Colin Preece involved in Linda's case. Ray Preece is mentioned in the article ( no relation ) to the sinister Colin Preece who has now retired but should be in jail. won't be long before they are exposed publicly about time. Neath Port Talbot Social Services have abused their postion by ignoring the Laws of the land. Surley by abusing their power it would be the duty of the Government to investigate. There needs to be action plan to prevent this from happening. keep up the wonderful work you are doing. Neath Port Talbot are in trouble over the Linda Lewis Case. If the Tories are serious about cleaning up the system,They should start by investigating tne linda lewis case. What's the point of Nick Clegg ?